He had no time for piety and quiet. He was a slave to unrest and impatience (Vita Norberti B, I 4). Coming to himself he was touched with grief of heart and began to say to himself: “Lord what do you want me to do?” Immediately as if He were responding: “Turn from evil and do good; seek peace and pursue it” (Vita Norberti B, II 7). But soon life became one of interior strife for St. Norbert. He had witnessed Emperor Henry V’s mistreatment of Pope Paschal II in Rome in 1111, when he traveled there in Frederick of Cologne’s retinue. These events left St. Norbert with a sense of uneasiness he could not dispel. The man who had been so happy to live at court no longer felt comfortable in that atmosphere of intrigue, where the emperor’s arrogance took the place of law. He left the court and returned to Xanten, where we find him in 1115. In late spring of this year, St. Norbert, accompanied by a single servant, was traveling on the road to Freden when a storm suddenly came up. A bolt of lightning struck the ground before his horse’s feet, and he was thrown to the ground. Shaken, he asked, “Lord what do you want me to do?” In response, he seemed to hear these words from Psalm 34, “Turn from evil and do good; seek peace and pursue it.” St. Norbert underwent a profound conversion. Under the influence of grace and led by the Gospel, he became sure of one thing: he wanted to put on the new man (Eph. 4:24; Col. 3:10) and live a life of perfection in the service of the Church, according to the Gospel of Christ, and in the footsteps of the Apostles. What he preached by his words he demonstrated by his works. And what he did he confirmed with signs and powers (Vita Norberti B, XIII 29). From the beginning of his conversion, St. Norbert aimed at a life of priestly perfection through imitation of the Apostles. He sought ordination to the priesthood, and gave his considerable wealth to the poor, in order “that he may follow the naked cross naked” ( Vita Norberti B, IX 22). Inflamed with the zeal of divine fervor, St. Norbert went about with “no purse, no sandals nor two tunics,” (Mk. 6:8) proclaiming by his words and example the necessity of poverty of spirit in order to enter the kingdom of God. As Christ had sent out his Apostles not only “to proclaim the message,” but also “to have authority to cast out demons,” (Mk. 3:15) St. Norbert was well known as an exorcist, and his biographer records many instances when he was called upon to exercise this office. Regarded as a “minister of peace and concord,” he had the gift of reconciling people and establishing peace between feuding parties. 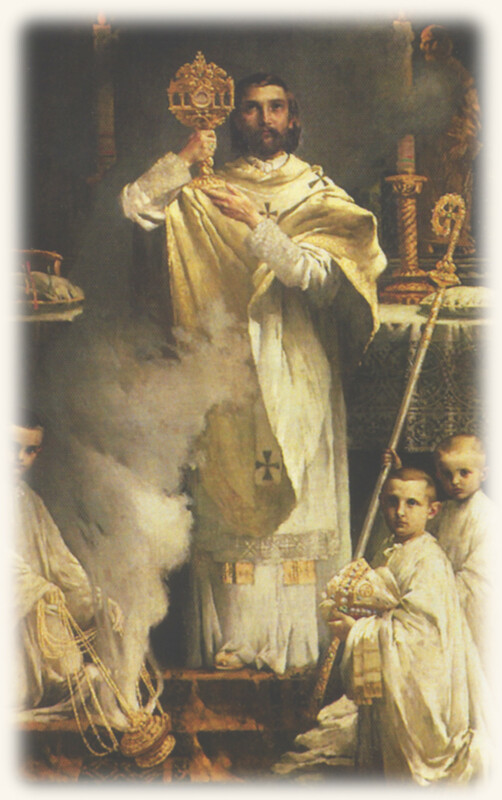 At the center of St. Norbert’s spiritual life and ministry was the Holy Sacrifice of the Mass. Contrary to custom of his times, he celebrated Mass every day, and it was after offering the Eucharistic sacrifice that he loved to preach, while his heart was overflowing with the love he had drawn from intimate contact with Christ. The Acts of the Apostles record how the first Christians “devoted themselves to the apostles’ teaching and fellowship, to the breaking of bread and the prayers,” (2:42), and that “the whole group of those who believed were of one heart and soul” (4:32). St. Norbert sought to realize the fullness of this Apostolic ideal in the founding of a new religious family. Norbert labored in gathering, disposing and preserving. He taught those he gathered to be lovers of voluntary poverty and imitators of Christ’s obedience in all things (Vita Norberti B, XVIII 37). In 1121, St. Norbert established the first monastery of our Order in Prémontré, France. 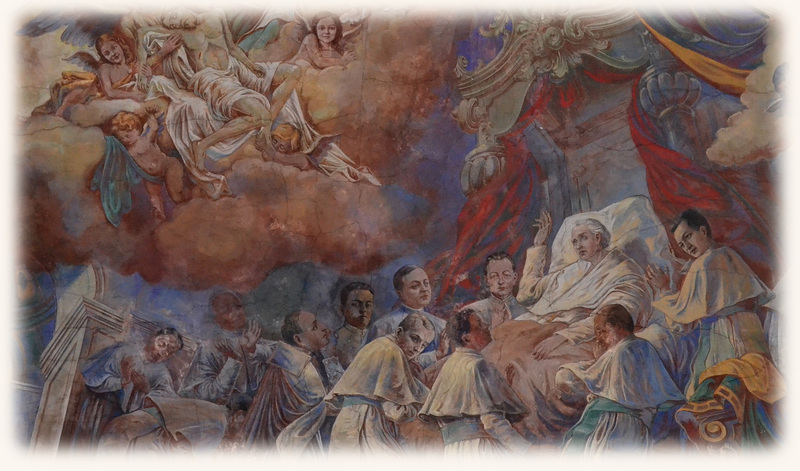 He had a great talent to speak to people, to fill people with enthusiasm for the kingdom of God, so much so that in a short period of time he was able to attract many men and women to the Apostolic Life and to start many foundations of religious communities of this “ordo novus”. Liturgical prayer held a central place in the life of Norbert and his first companions. 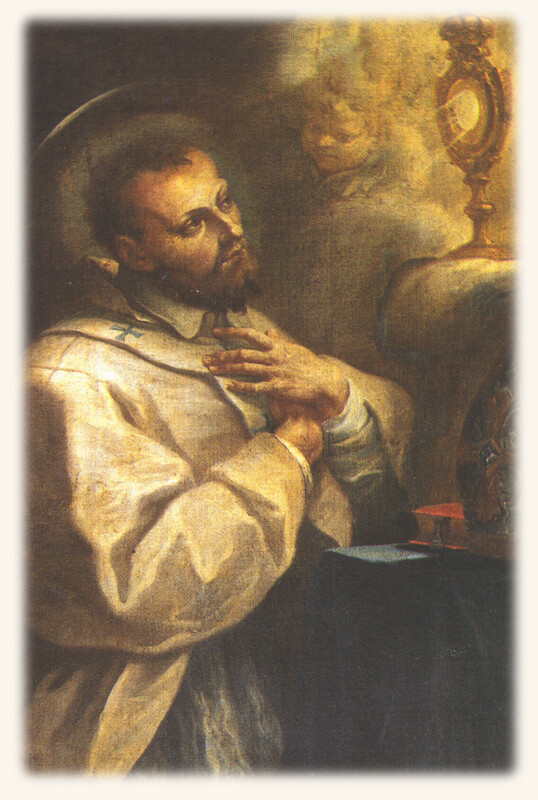 The Eucharist, the heart of liturgical prayer occupied such a place at Prémontré and in the life of St. Norbert that later tradition made Norbert the Apostle of the Eucharist. 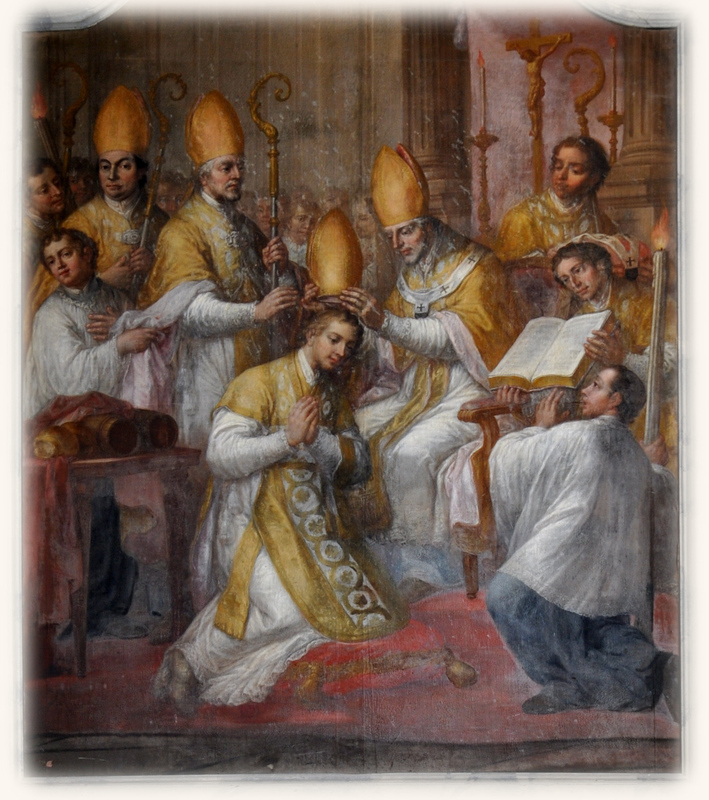 After Norbert was consecrated bishop and elevated to the episcopal chair, he was mindful of the apostolic command that a bishop should be the steward of his house (Vita Norberti B XLIV 91). In 1126, St. Norbert was elected archbishop of Magdeburg, Germany. He worked for the kingdom of God on all levels, and ready to commit himself to peace and justice, did not shy away from arguments and conflicts, neither in his own diocese nor in the conflict between emperor and pope, as he courageously defended the rights of the Church. Filled with the Holy Spirit and in full possession of his senses and while giving his blessing to those in attendance, Norbert died peacefully (Vita Norberti B, LII 113). St. Norbert died on June 6th 1134, the Wednesday after Pentecost. By order of the emperor, his body was laid at rest in Abbey Church of St. Mary’s at Magdeburg, where he had installed the confreres of his Order. 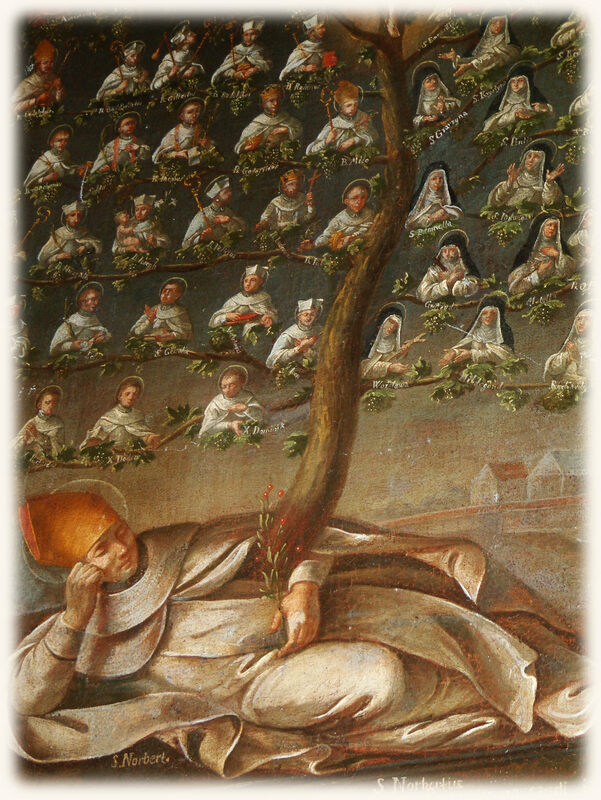 St. Norbert’s body was transferred to the Norbertine Abbey of Strahov in Prague in 1627 where it remains to this day, and is venerated by his sons and daughters from all over the world. As metioned above, St. Norbert is venerated as the Apostle of the Eucharist. He is usually depicted with a ciborium or monstrance in his hand on account of his extraordinary devotion to the Most Blessed Sacrament. He is invoked as the patron of Bohemia, Magdeburg in Germany, and of peace. St. Norbert is also a patron of expectant mothers, as well as traditionally invoked by married couples who want to conceive a child, with many favors attributed to his intercession. References include: “Message for the Norbert Jubilee, 1134 — 875 Years — 2009” Abbot General Thomas A. Handgrätinger, O.Praem. ; Vita Norberti B; The Order of Prémontré: History and Spirituality, Rev. Bernard Ardura, O.Praem; Norbert and Early Norbertine Spirituality from The Classics of Western Spirituality series, selected and introduced by Rev. Theodore Antry, O.Praem., and Carol Neel.